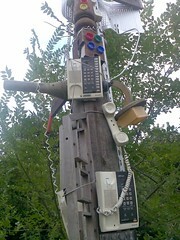 Blackdown: Hey Geiom, so lets’ start at the top: when did you start producing? Geiom: Its been a while now - A friend and myself financed my first 12" back in 1995 - I only had one synth and drum machine at that time. I think I was still in the aftershock of rave, looking for new sounds and getting inspired by the more thoughtful styles of the Black Dog/AFX etc. B: Where are you from/based? G: I grew up in North London - Recently found out I went to the same school as SLT Mob - its a small world... I have been living in Nottingham for a long long time now. Don't believe the media hype - Nottingham is not the most dangerous place in the country! Its a great city but not the easiest to promote independent music events in. B: How many releases have you had? G: In terms of albums there has been: “Sellotape Flowers” as Geiom, “Magic Radios” as Kamal Joory, a collaboration with multi-instrumentalist Morgan Caney which is a hybrid of acoustic and electronic sounds. “See inlay for details” as Hem - experimental/glitchy/ambient project on Staalplaat. “Small medium” as Hem - collaboration with producer Metamatics. One important event was the inclusion of Overnight Biscuits by Kode 9 on his dubstep Allstars 3 mix - I think this introduced me to the dubstep community and helped to start Berkane Sol. 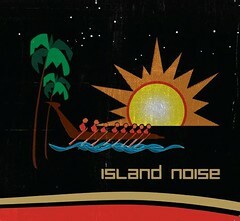 I will be releasing the new album 'Island Noise' on Berkane Sol in November. 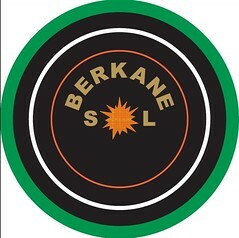 Berkane Sol has now had 5 12" releases. I have also put out many other singles and tracks on compilations over the years. G: Its one influence for sure - I also like a lot of older electronic music like Eno, Tangerine Dream, Raymond Scott, you can find stuff made back in the 60's and 70's that still sounds like the future. I think that both AFX and Black Dog started out with a more sound system style - Black Dog used to make jungle - so I don't think these particular artists are in opposition to physical music. Although AFX has made some deliberately awkward music in his time! We saw Autechre playing live at the Bloc Weekend event earlier this year and their set showed influence from almost every electronic style I can think of, including dubstep and grime. What they were doing was totally physical and had tons of bass pressure – It was designed to engage the audience rather than alienate them, which is something that electronica can be found guilty of. I've noticed that some people like Benga and Skream are using effects and edits that sound more like electronica than dubstep so I think stuff crosses over in all directions. I think the fact that Benga and Skream are best friends and make loads of very influential music together is proof that the idea of ‘black’ and ‘white’ music has become redundant, at least in certain communities. B: With an electronica background, both as a fan and as a producer with releases on Staalplaat and in collaboration with Metamatics, how did you come to be interested in dubstep and what excites you about the music? G: I was into grime mainly through helping local MC's to make beats. I like it a lot but it does annoy me sometimes, mainly when the lyrics are waste. But I have learnt a lot from the Nottingham hip hop and grime scenes. 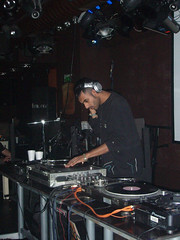 I first heard dubstep properly when the FWD>> tour came to Nottingham - I think it was Kode 9, Youngsta, Oris J and Crazy D. I was led to believe that it was a grime event so I couldn't believe that the MC was hidden away with no ego and was just hosting more than taking centre stage. I was surprised by the variety of influences I could hear and in general just blown away by the experience. Sounds cheesy but its true. B: You were born in north London but live in Nottingham. How has your environment, both in the past and more recently, influence your music? G: My family moved out of London to the countryside when I was a teenager and it was during that time that I got into the emerging rave culture. I think I ended up wanting to make my own music partly out of rural boredom, partly because I thought I had something new to offer. Experiencing the non diverse culture that exists in most of Britain away from our cities (I was one of only two non white people at the school I ended up at) made me fully appreciate the importance of our immigrant populations. B: You mention you think Nottingham has of late, had a bad rep, but why, despite being a nice university town, do you think it got its gun crime reputation alongside London, Manchester and Birmingham? Was Colin Gunn’s crime syndicate, that they recently took down solely to blame? Its true that we have crazy territorial problems here – I only live less than half a mile from the city centre and know local youths that are scared to visit town. I know that a certain type of person actually feels empowered by the idea that their ends is a no go area for strangers, and actively tries to encourage that. I think that the media hype actually adds to that problem – people are aware that Nottingham is notorious. Sadly these people fail to realise that they are often imprisoned in their ends and hardly ever go anywhere else. Its interesting to note that London has always had high violent crime stats yet does not grab the headlines as much as other cities. B: How did Kode9 come to know about “Overnight Biscuits” by yourself and what is the thinking behind Berkane Sol, both musically/label ethos and the name itself? G: I sent Kode 9 a few CD’s and he seemed to get more into them over time – he cut some of the tunes and played stuff on Rinse. I sent tunes to loads of labels and got mostly no response at all. Decided to do it myself and it seems to have worked out well. The label is mainly for my own tracks but I have a couple of other people that I would like to release. B: What’s the plan with your new album 'Island Noise' on Berkane Sol? G: It’s a CD album of new tracks packed in some futuristic/surreal artwork by my designer friend Barret. I would rather just put out vinyl but I know there are a lot of people that don’t have a turntable, and I think my tunes are good to listen to at home/in the car as well as on a system. I am inspired by all the sounds that exist around me and we live on an island, so the title is related to that and also other islands that figure strongly in my imagination – Mauritius, which is where my family is from, and Jamaica, which must be the most musically important small island on the planet. B: How did you come to get booked at DMZ? What is it like to play there? G: I would like to think that I have maybe created my own small space within the dubstep sound/community and that DMZ appreciate that. It does feel like a real privilege to be asked – I learned a lot about the music from attending those events in the past and so it felt good to be on the other side of the booth. I have been getting more bookings abroad than in the UK so it was sweet to play at the most important UK event. DMZ has a special atmosphere created by the diverse crowd as well as the performers. It even brings people from as far away as the US to meditate and Mass has a heavy soundsystem. It’s been a real pleasure watching the event turn from a specialist night for the heads into a full on big rave over time. B: Tell me about your work with vocalist Khalid? How do you know him and what was the thinking behind the release? G: My girlfriend was organising a charity dinner after the Pakistan earthquake and we wanted some live music for it. I found Khalid in the process. He’s a big fan of Mohammed Rahfi, one of the singers I grew up listening to. He had some songs written for him in Pakistan some years back – it seems that you can pay for someone to write the lyrics and melodies for you. He had recorded them in a studio out there with session players – the recordings were cool but ruined by cheesy drum machine and home keyboard sounds. So I chose one and got him to sing it over a dubstep tempo drum pattern I had put together. Then I built the music around the vocal – the tabla and sitar parts are programmed, I played the harmonium live and then edited it and did the same with the flute sections provided by my friend Dorian. B: Tell me about the amazing LP track “Pheli Nazir?” What does the track name mean? Who is the vocalist and what was the thinking behind the track? G: It means ‘first sight’ – it’s a love song, like most Indian pop music. It’s another track with Khalid (he wrote this one himself) and was made in the same way, but without the live instruments. I think it’s a good example of how diverse dubstep can be – “Zalim Maar Daala” is the same tempo but sounds much more hectic than this tune, which I think is pretty laid back. B: Do you have any interest in the other desi/Asian/Far Eastern influences in dubstep? G: I think tracks like the Loefah mix of Monsoon are hard to beat – it feels like a unified piece. I think some of the newer Asian sounding stuff is a bit ‘soundbite’ but I could say the same thing about a lot of the ‘stuck on’ sounding reggae samples that are being used at the minute. But I know from experience that its not easy writing an original Asian song from scratch and that mashing stuff together has often introduced people to sounds they didn’t know about. B: What other genres of music excite you right now? G: I listen to pretty much all styles of music – for example reggae/dub/ragga is a big influence, I loved rap ever since the breakdance era, I listen to a lot of (mainly older) Brazilian music, and I am fascinated by traditional music from many parts of the world. Characters like Sun Ra are inspirational on more than just a musical level, he had a whole mythology surrounding him. I love film soundtrack music but I don’t really get into ‘traditional’ classical orchestral music. B: Jon Rust and Benny Ill from Horsepower rock the Berkane Sol t-shirts, Benny wearing his at the Tempa Radio 1 special recently. Are you going after Boy Betta Know’s t-shirt market? Are you going to do pink small tees for the ladies? G: Already on that one – white small ladies shirts on sale now! Jon Rust always said the logo would look good on a shirt – we thought it might be a good way to get the label name and logo out of the record box – it’s the sort of thing that just gets hidden away in a stack of vinyl normally. B: All this talk of “inner” sounds, what about looking out, to politics worldwide: is this something you follow? How do you feel about the terms “war on terror” and the “axis of evil?” Do either exist? G: I can’t imagine anyone not taking an interest in some of the crazy stuff that is going on all over the place right now, I think it would be safe to say that if there is an ‘axis of evil’ then it centres around Wall Street and the other financial centres of the world. These institutions create and support misery on a scale the terrorists can only dream about. The other expression is totally dumb – how can you wage war on a concept? Is the military presence in Iraq and Afghanistan reducing our risk of terrorist attacks? – I don’t think so. Just got around to reading this. Nice interview for sure. Excellent interview - many thanks.